Giveaway- Salon Grafix Thermal Spray! 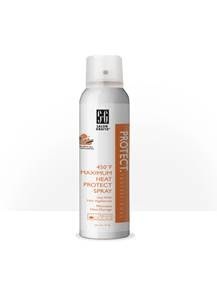 "...This is the first product which protects hair up to 450 degrees of styling heat. It is perfect for flat irons, hair dryers, curling irons or any other heated instruments that may damage the hair..."
Salon Grafix is now the #1 brand of aerosol hair spray sold at retail stores across the United States and have recently become available in Canada, with plans to expand to Mexico and Europe in the near future. In 2004, we opened a state of the art distribution center in Auburn Hills, Michigan to accommodate our tremendous sales growth and increase our shipping efficiency, making it less likely for your next store visit to result in an empty shelf where your favorite Salon Grafix product should be. Be sure to checkout the Salon Grafix Facebook page with celebrity hair tips, great information about hair and amazing coupon offers just for those who “like” their page. 1 of my lucky readers will win a bottle of Salon Grafix Thermal Spray! MANDATORY ENTRY: “Like” Salon Grafix on Facebook, and reply to a post that Salon Grafix has posted on Facebook! 6. Tell me who this would be for, if you won! 7. Subscribe to my emails. 8. Follow me on Twitter. 9. “Like” me on Facebook. 10. Follow me on Networked Blogs. 11. Follow me via GFC. 12. Put my new button on your blog! 13. How often do you use heat on your hair? i liked them on left a comment as Kim H.
Liked them and commented about new spring hairsytles. If I won it would be for myself. I use heat on my hair 3 or 4 days a week.